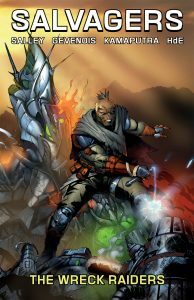 Salvagers: The Wreck Raiders is the complete Volume 2, collecting all four chapters of the second Salvagers story arc, written by Bob Salley, with pencils and inks by Chris Gevenois, colors by Fahriza Kamaputra and letters by HdE. Residents of the Va’Rodvian Fueling Station had better buckle in for a bumpy ride. There are several groups converging, each with their own business (mostly illegal) to conduct, or agenda (rarely peaceful) to be served. Captain Billy Roenick and crew- Teagan, Brigby, and Ty’r- have just come from a particularly rough salvage run, and need to unload a highly illegal Blackbane battle tank. When a trusted contact falls through, Billy and Brigby will have to find another buyer for their black market goods. Klandarian Largo Raas is looking to apprehend Billy for alleged war crimes committed during the Tipernian Invasion, an action made difficult for Raas by his own status as a wanted fugitive. Meanwhile, back aboard Billy’s ship, events are spiraling as a group of Klandarians questions Teagan and Ty’r regarding a missing canister containing a dangerous chemical compound. All of this is going on while the Federation’s elite black ops unit Blackbane- as well as other interested parties- searches for their missing property. 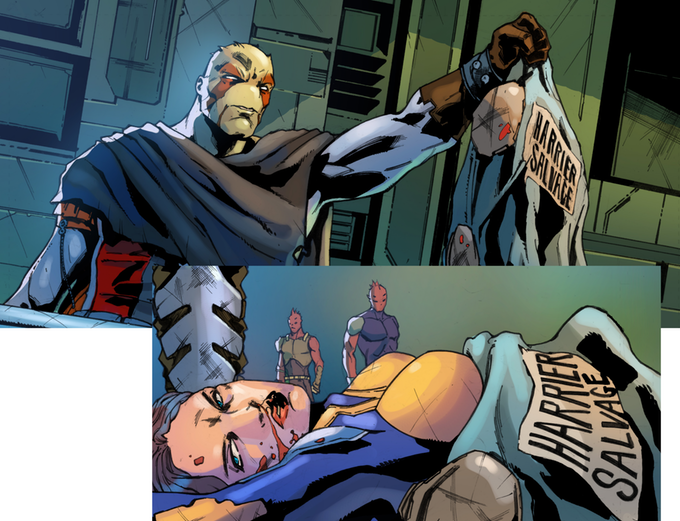 Phew… it’s a good thing Salvagers doesn’t come out in standard 24 page issues. There’s a lot going on here, and it’s happening fast. A shorter issue format could make keeping track of everything even more challenging. Salvagers is a sci fi action story that maintains a gritty tone found in shows like Firefly, or The Expanse. The layered story also features multiple factions engaged in complex conspiracies, to keep readers occupied in between gun fights and chase scenes. 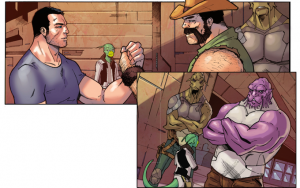 Creator and writer Bob Salley is working hard to maintain Salvagers’ breakneck pace and has made some significant improvements in the storytelling from his first arc to Wreck Raiders. While the first entry was an impressive opener for his sci fi action title, there were some jumps in the narrative that gave me the impression that Salley was trying to accomplish more than he really had the time or space for. The latest entry is still moving along at a pretty fast clip, but the writing is laid out a little more evenly and events do a much better job of moving the story forward. There’s still a lot of bouncing around between the multiple threads, but overall it was much easier to follow. Having changed artists from the first story arc, Salvagers suffers none of the dangers inherent in stylistic changes. New kid on the block Chris Gevenois does a very good job of maintaining much of the original look, established by George Acevedo in the series’ first issues. If there’s a downside to that at all, it’s found with some of the character designs, particularly the Klandarians. Not to sound like a rube, but they all look alike, right down to their fashion sense (the poncho is very popular in the distant future…). I get it, they’re “aliens” and to be honest I don’t know that it’s really a problem. I suppose Gevenois could give the Klandarians name tags or something, but they’re all wearing ponchos. Are we even going to be able to see them? Fahriza Kamaputra does his part, breaking up some of the similar character designs using color schemes… Both of these artists deserve a round of applause- and maybe a drink or two- given the complex scenery and the multitude of background characters of all shapes, sizes, and races. 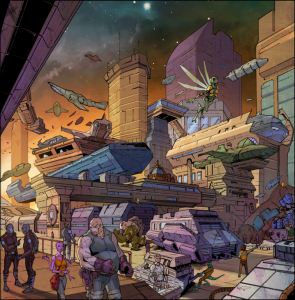 Science fiction is thickly populated with large omnipotent Empires, neat and clean Starfleets, whether they be dedicated to galactic conquest or exploration. What Salvagers brings to the table is its focus on the day to day problems of plain old workin’ folk. Billy Roenick and crew aren’t looking to unlock the secrets of the universe (incidentally, the answer is still “42”). They’re just out to make a living any way they can, whether it’s legal or maybe a little bit less than. The problem is that there always seems to be a large omnipotent Empire, Starfleet, or Federation looking to stick its nose in and make things difficult for hard working folk. It’s that working class attitude that makes Salvagers a blast to read. Fans of The Expanse, Killjoys, or Firefly should be able to find something to like in this series. Its layered setting, complete with history and characters full of backstory to spare, should be enough to keep most readers busy and entertained. Unless you like linear stories where everything that happens on the page is all that there is to tell… In that case, shoot me an email. I can probably help you out there too.